How long had it been since Nehemiah heard about the state of Jerusalem? What can we learn about Nehemiah’s job in this passage? What caused the king to ask Nehemiah why he was sad? Why was Nehemiah very afraid? What can you learn about how to deal with fear from Nehemiah? How did he deal with his fear? What can we learn from Nehemiah’s response? How did Nehemiah respond when the king asked him what he requested? What does his response show about his preparation/planning for this issue? What do we learn from him about prayer? What do we learn from him about planning and preparedness? How does prayer work together with these things? What specific requests did Nehemiah make of the king? What does this show us about him? Are there any lessons we can learn from this? How did the king respond to Nehemiah? Why? What principles can we learn from this? Esther 4:11, 5:1-3 – This type of rule in the king’s court is likely why Nehemiah was afraid. Matthew 7:7-12 – Ask, seek, knock. Luke 14:28-33 – Calculate the costs before building or going to war. Proverbs 21:5 – The plans of the diligent lead to abundance. Proverbs 6:6-8 – Learn about planning from an ant. James 4:13-15 – Planning should involve seeking God’s will. The month Nisan – How much time had passed? I had not been sad in his presence – It seems it was against court traditions for officials or nobles to be sad in the presence of the king. The officials’ job was to serve the king and make him happy. The king seemingly didn’t want to be reminded of the troubles of his people. They were to do their jobs well and leave their problems outside the court. After all, their problems would be considered of far less importance than the very smallest of the king’s own problems. In the end, this shows the perspective that the king’s happiness and well-being was of primary concern. The people existed to serve the king and not the other way around. The king noticed Nehemiah’s sadness – He had kept it to himself for quite some time, but on this day (whether intentionally or not) his sadness was visible enough that the king noticed and commented on it. Nehemiah was very much afraid – Notice his response. He wasn’t excited about the opportunity to share with the king or at least that wasn’t his primary emotion. He was scared. He was scared what the king would do to him for breaking this tradition. Artaxerxes could have certainly fired him. But he could do a lot worse. He could have him executed. King’s at that time didn’t require much of a reason to have people killed. But notice in the following verses how Nehemiah responded. He was scared, but he didn’t let that fear control him. He didn’t freeze. He didn’t panic. He didn’t turn around and run out of the court. He didn’t apologize and beg for forgiveness or mercy. He was afraid, but there was an opportunity here. It was the opportunity he had been praying for. Even though he was afraid, he moved forward to take advantage of this opportunity. He didn’t waste this chance. In fact, we will see that he was very bold. Application: Fear is a natural reaction sometimes. But God doesn’t want us to allow our fear to control us. We must move past our fear to do what God wants us to do. What are some things you may be afraid or nervous about that you may need to do anyway? Making sacrifices for God’s kingdom. How can you be bold in these situations? The king asked him for his request – In the last chapter we saw that Nehemiah was praying for for this issue. He was also praying that God would grant him compassion in the sight of the king. Now we see that his prayers were being answered. Nehemiah saw the answer and responded appropriately to it. This is simple, but an important lesson for us. Application: When you pray for something, watch carefully for the answer! We don’t want to pray for something and then miss it when the answer is right in front of us! Nehemiah’s request to the king – Here we see Nehemiah frankly asks for the king’s permission to himself lead an expedition to repair the wall! This is a huge request! Generally kings may be skeptical of walled cities in other nationalities that were subjugated to them. If Jerusalem was walled, logic says the people in it may decide to rebel again. But Nehemiah wasn’t afraid to make big requests. Why not? We know he had already prayed about it. And I believe God had already led him to make this plan. He knew what he was going to ask before the king even asked him. William Carey said, “Attempt great things for God; Ask great things of God.” This should be our attitude as well. Don’t ask the question, “What can I do?” Instead ask the question, “What needs to be done?” That is the question Nehemiah asked. After he realized what needed to be done, he was bold enough to go for it. This request was also quite abnormal. There was apparently no benefit for the king. Instead he lost a trusted official for a long time. God was obviously working. How long will your journey be? – Nehemiah was able to quickly give a clear answer. This tells me that he had prepared well. He had researched the situation. He knew about how long it would take to get there, how long it would take to build the wall, and how long it would take to go back. Trusting in God is not an excuse for a lack of preparation. Instead it is a reason to prepare all the more because we believe that God will give us a chance to put those plans into action. Nehemiah’s additional requests – Nehemiah then asks for letters of protection that he can give to all the regional rulers of the lands he will pass through. Bold. Wise. But he doesn’t stop there. He then asks for another letter, this one to be given to Asaph to ask for materials to use in the rebuilding of the wall. How did he even know the name of Asaph? It would seem unlikely he would haul the materials for the wall the entire 5 month journey from Susa. That would been that Asaph was likely the keeper of a forest much closer to Jerusalem. It would also seem unlikely that Nehemiah and the other officials would automatically know the names of all the people in the huge Persian government. That would mean that Nehemiah had already researched this issue ahead of time. He had gotten all the info he would need to communicate to the king when the opportunity came up so that he would know exactly what to say. Imagine what the result would have been if the king asked him what he wanted and Nehemiah said, “I don’t know. I haven’t really thought about it yet. Let me get back to you.” The result would not have been good. By having a detailed plan ready to go, Nehemiah demonstrated to the king he was competent to be entrusted with this task. He gave confident answers which in turn made the king confident that he knew what he was doing. Also, this request for materials was the largest yet. Not only did Nehemiah ask the king for permission to rebuild the wall, he asked him to finance it. And the king said, “Sure!” Wow! The only conclusion he could make is that “the good hand of my God was with me.” Nehemiah had prepared the best he could, but he gave all the credit to God for his success. Application: We must also prepare. We must be diligent. We can make plans. When we do, we must pray to God for wisdom. We must not leave God out of the plans. We shouldn’t make plans on our own and then ask God to bless those. God should be part of the process from beginning to end. A lazy person says, “I will trust in God. I don’t need to make plans. I don’t need to prepare.” A prideful person says, “I will make an execute my plans on my own. I don’t need God.” We don’t want to be prideful or lazy. Finally, we should give the glory to God for the results and not take credit for ourselves. What do we learn in verse 10 about the cause for Nehemiah’s visit? What reaction we see in verse 10? Why may Nehemiah have gone to survey the wall at night and not tell anyone? What else can we learn from his character from his survey of the wall? Proverbs 29:18 – Without vision the people perish. Isaiah 41:10 – Fear not. I am with you. I will uphold you. Ezra 1:5, 7:6 – God was also with Ezra. It makes all the difference. Proverbs 24:10 – If you faint in the day of adversity, your strength is small. Joshua 1:9 – Have I not commanded you? Be strong and courageous. 1 Peter 4:12-13 – Do not be surprised at the fiery trial when it comes upon you. Nehemiah goes on the journey. The king had sent officers of the army with him to keep him safe on the way, another example that God had made the king favorably disposed to him. Verse 10 – In this verse we see the beginnings of what will turn out to be very pesky opposition. These were both likely officials. Note that in verse 9 Nehemiah was showing the governors the letters from the king. He hadn’t told others about his purpose yet. Both Sanballat and Tobiah heard about his plan in verse 9, meaning that they were officials of some high ranking, perhaps even regional governors. Verses 11-16 – Nehemiah spends the first three days planning and surveying. He wanted to know exactly what the project in front of him would require. He doesn’t make rash decisions. A leader should understand all the potential difficulties and obstacles in front of him. He wouldn’t want to propose his plan only to be surprised when someone pointed out a huge problem he knew nothing about. Application: Don’t be hasty. Don’t make rash decisions. And don’t act without thinking and researching. Before making important decisions spend the necessary time required to gather all of the relevant information you will need. 4. 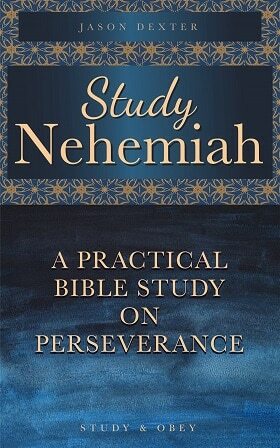 Nehemiah went secretly at night – He wasn’t ready to tell others his plan yet so he did his surveying at night. As a leader, he knew it was important to make a clear and complete proposal. That required not saying anything until he was ready to say everything. How did Nehemiah communicate with the people? What was his plan? How long had it been since they had first returned to Jerusalem? Why hadn’t the wall been rebuilt before? Why was Nehemiah successful in convincing the people this time? What do we learn from him about leadership? How can you learn from this to be a better leader? What opposition did they face? How did Nehemiah respond to the opposition? How should we respond to opposition? John 14:1 – Let not your heart be troubled. Psalm 37:5 – Commit your way to the Lord; trust in Him and He will act. Verses 17-18 – Nehemiah proposes rebuilding the wall. It is likely that these verses are a summary of what he said and not a complete record. We know that Nehemiah was a detail oriented person. We also see that in verse 18 he tells them about the king’s words, but he doesn’t record that conversation here. The main point of his conversation was three-fold. Firstly, the what. He proposed rebuilding the wall together. Second, the why. Jerusalem was in a bad situation. Thirdly, the who. God. God was with them and this was all the reason they needed to just do it. He said, “Let us arise and build.” I love the word “arise.” They had to stop sitting down. They had to stop being complacent. They had to take action. They had to be unified. Every work for God is like this. Application: We may not have a wall to build, but we all have something to build for God. What does He want you to build? Are you building it? Are you building your kingdom or God’s kingdom? Building for God takes an effort. It is not easy. It is a lot easier to sit and do nothing (people sit about one third of their lives.) The lesson for you today might be very simple. God may want you to arise and build for Him! Let’s together put our hands to the good work!